In the front yard I get to see cool sunsets, but there’s a big street light out there interfering with the view once it gets dark. 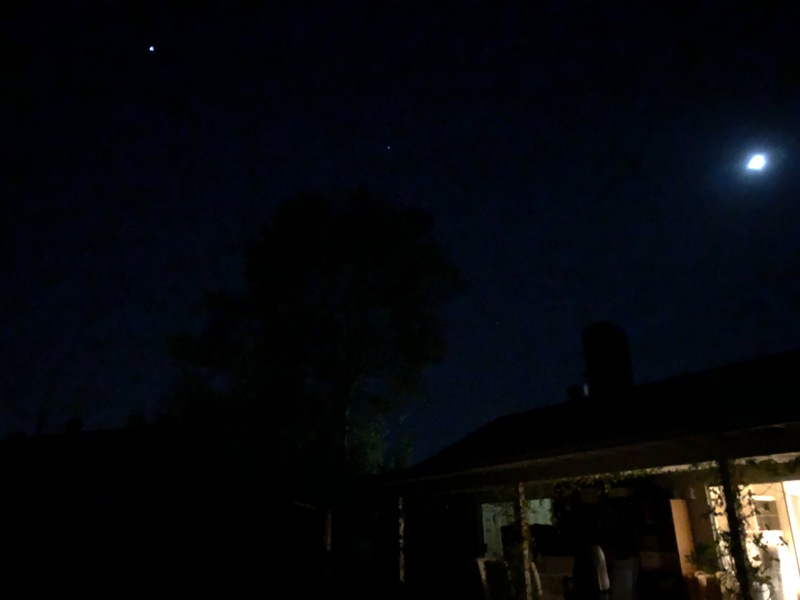 (Gotta figure a way to turn that off when I need to…) But taking the trash out tonight I note that once you get close enough to the house to be in the shadow of that big street light, there’s a little patch of relatively dark sky there. At least, dark by “in the middle of one of the top 20 metropolises on the planet” standards. Even with just my cellphone, Jupiter’s nice and bright and of course any camera will pick out that nice first quarter moon on the right. In between, even Spica can be seen. Just wait until I find and have a minute to start playing with the better equipment!